Intertwining stories of two infamous killers in postwar London. In her first book, documentary producer Dawson (Journalism/Univ. 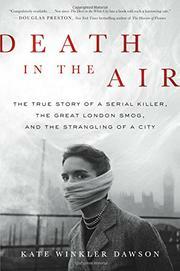 of Texas) provides more of an examination of the London smog of 1952 than the murderous actions of serial killer John Reginald Christie (1899-1953). Because the smog was a more prolific killer than Christie, that story unquestionably warrants the author’s attention. Over five days, London was overcome by a “fog”—later rebranded as smog—so thick that visibility was almost nonexistent, and the air filled with toxic levels of multiple pollutants. More than 4,000 people died in the weeks immediately following the smog, and another 7,000-8,000 deaths were attributed to the poisonous air over the subsequent few months. In the same winter, Christie murdered four women, including his wife, bringing his total known victims to six. Dawson deftly weaves the tales together in an engrossing narrative that reads like a thriller. Christie’s story benefits from being told alongside that of the smog, creating a more sinister, darkly romantic atmosphere than a traditional true-crime book. The main weaknesses in Dawson’s debut concern the endings of the two primary narrative threads. In the case of the smog, the author effectively shows how the government’s too-little, too-late solutions to keep the deadly event from repeating itself were completely unsatisfactory, but she doesn’t go deep enough into how woefully inadequate they proved to be. Regarding Christie, in an anticlimactic conclusion, he confessed and was hanged seemingly because he decided he didn’t feel like hiding the bodies anymore. Dawson could hardly have embellished Christie’s story, but as Christmas 1953 approached, doctors were concerned about the solutions offered by the British government, and some follow-up there would have been welcome. Despite a few minor flaws, readers will remain hooked on this compelling story and will eagerly await Dawson’s next book.